Tomasz Olkiewicz has a wealth of experience in coordinating and participating in restructuring projects aimed at securing an effective legal and tax structure. He has managed a number of projects that involved restructuring the operations of companies as a result of changing market conditions (e.g. related to Poland's accession to the European Union or a changing business model). He has been a member of many steering committees coordinating work on complex projects. He is in charge of MDDP's pharmaceutical team and is developing the commercial law practice. 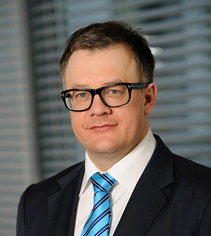 Tomasz has participated in the work of parliamentary committees amending tax and commercial legislation. For the majority of his career, he has been involved in tax advice services. In the years 1995-2004, he worked for Ernst & Young, most recently as Senior Manager. MDDP Olkiewicz i Wspólnicy is a new type of law firm that distinguishes itself through its comprehensive and innovative approach to serving clients in the 21st century. The MDDP law firm team comprises experienced business legal advisors, who combine sound legal expertise with an innovative and dynamic approach. MDDP law firm operates as part of the MDDP group, and complements its existing service offer of tax, business, financial, accounting and audit consultancy. Close cooperation with other MDDP departments allows us to ensure a high-quality service not only in the area of law, but also in all other areas that affect a company’s operations.